Getting into underwater photography is addictive. For those just starting out and looking to buy a compact camera (or perhaps a more advanced underwater photographer looking to buy a back-up to an SLR system), the choice of cameras and accessories is nothing short of overwhelming. Over the next few issues I will be sharing some tips to help you get to grips with the set-up and show how to achieve award-winning results with any kind of compact. The hardest part in getting started is knowing what camera to buy. What do you look for? Ask yourself what you want to achieve from underwater photography and what your budget is? What kind of depths do you dive to so that the housing is adequate. If you like deep diving, then housings made by Ikelite for compacts will be more robust than the camera's own brand of housing. Then look at a system with which you can grow in the future. Next ask a few more involved questions such as: what is the battery life like? Can the built-in flash be used with the camera's housing or does a shadow occur if there is a large port on the housing? Is possible to fit external lenses onto the front of the housing? For those passionate about wreck photography, a wide-angle lens on the front of the housing is a must to photograph large subjects. However, for those who are crazy about nudibranchs and macro photography, this might not be so important and may decide on a strobe as their first compact camera accessory to really bring out the colours of their subject. Would you like to get really creative with your underwater photography and have full manual control over your settings to change both the aperture and shutter speed of your camera to achieve darker backgrounds with your photographs? Or if you are shooting with a strobe, being able to adjust the aperture settings on a compact is absolutely essential to control the lighting of your subject and prevent it being overexposed. Sound daunting? Don't worry, all will be explained over the forthcoming issues. Here the subject is too far away to make a real impact. Getting closer and approaching your subject slowly helps to make a much better photograph. (Left) Fuji Finepix F3001/6th @ F8 Built in flash ISO 100(Right) Canon Powershot A570.1/500th @ F8 ISO 80 Built in flash. invest in a good second-hand model and be able to buy a strobe or a wide angle lens at the same time. Lastly, make sure you can see the screen underwater and access all of the important menu functions easily. 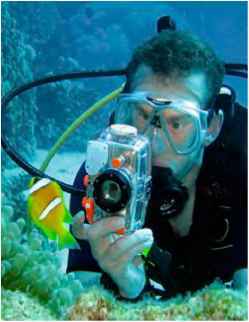 This is especially important for those who are planning use their camera in temperate waters where gloves make accessing the controls difficult. Make sure you can access the film speed, aperture and shutter speed controls as well as white balance. The latest compacts made by Canon can custom set a button to become a one-touch manual white balance button which can be really useful when taking photographs of wrecks and caves to help bring the colours back in some scenarios. Before choosing, always find out as much information as you can to save you any expensive purchase errors, forums such as Wetpixel (www. 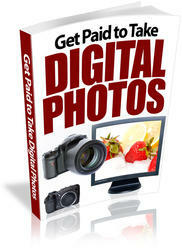 wetpixel.com) are an excellent resource for any newbie getting into underwater photography. Before you start taking images, there are a couple of really important Menu Settings that need to be adjusted to make sure that the camera will focus exactly where you want it too. One of these is the setting called the AiAF or AF Frame mode which always needs to be set to Centre. The other setting is the Face Detect Mode which always needs to switched off. If either of these settings are left on, the camera will search for what it thinks is the subject underwater and if you decide to take a photo of a moray eel hiding in a rock, guess what, the camera may think that the rock is the subject, leaving you with a fluffy, out-of-focus moray eel. So now you have an idea of the equipment you need, what are the key points to being able to get those fabulous shots? The golden rules of underwater photography are always the same. Perfect Buoyancy, staying still for long periods during a dive to study subjects and the ability to get as close as possible to your subject while staying level and shooting up (although there are some subjects that suit looking down better!). Talking to dive guides before the dive will help you find the best subjects as well as those that you should keep away from, such as titan triggerfish when they are breeding. Always approach your subject as slowly as possible, so as not to frighten it. Get as close as you can and try to fill the frame as much as possible to really give an impact to the photo. It really does make such a difference. Pier atNuweibaAuto Underwater ModelMannal White Balance Both shots were taken at the same time of day at a depth of2.7 ms. However, the photo taken with manual white balance appears a little too unnatural compared to the one taken with the underwater setting at such a shallow depth. small creatures and even a mode for snorkelling. All of the modes in each different make of camera work in exactly the same way by adjusting the colours to make underwater images look less blue-green as the colour is absorbed by increasing depth of water. This mode can work very well from just beneath the surface to about 10 metres in depth. Always shoot with the sun behind you and when in low light conditions, be careful as the camera may choose a higher film speed to expose the picture correctly resulting in noise issues. Noise refers to small specks of colour that interfere with the clarity of the image and occur in sources such as poor lighting and can be red, green, orange or other colours. 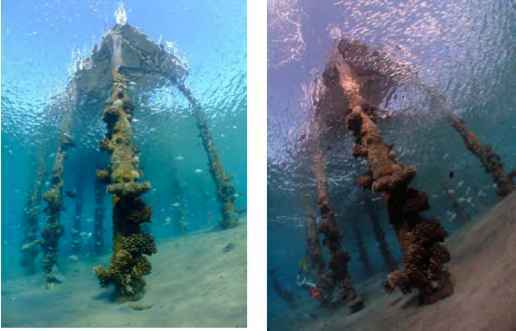 The picture taken of this pier at Emperor Diver's Centre in Nuweiba was taken with a Fuji F3 ID on the underwater setting at a depth of 2.7 metres. The other picture was taken at the same time on a manual white balance setting. Note the difference in colours at shallow depths. Just by gaining confidence in changing a few settings on your camera can change a blue photograph into a beautiful, colourful one and make you enjoy your underwater photography even more. 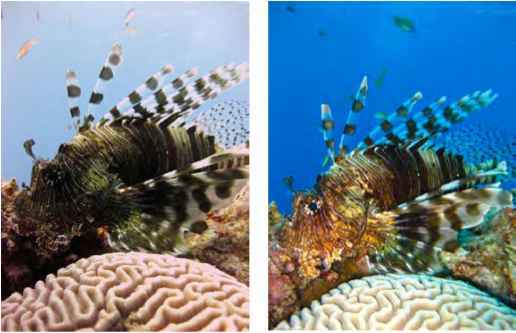 Having the confidence to change film speeds underwater does not only help to control overexposed subjects or blurry fish, but can also give an artistic effect to particular subjects. Film speed or ISO refers to the sensitivity of the camera's chip to. When in lower light conditions, a faster film speed is needed to ensure that subjects are sharp and in focus. When in shallower water, a lower ISO number such as 100 will help to enrich the colours of static subjects, such as wrecks and reefs. Using this particular film speed will also help to give beautiful punchy colours to macro subjects when the camera is used with an external strobe and helps to avoid overexposure of the subject. So where do you use a speed of 200? This ISO number suits faster moving subjects such as clownfish, lionfish, turtles etc, and by pressing your finger lightly on the shutter button, keeping it in the halfway position and panning with these kinds of subjects, will help to ensure that the resulting photograph is sharp and in focus. Moving onto 400, this is best used where the light conditions are lower such as photographic scenes where flash is not being used such as deeper dives, cave shots and inside wrecks. 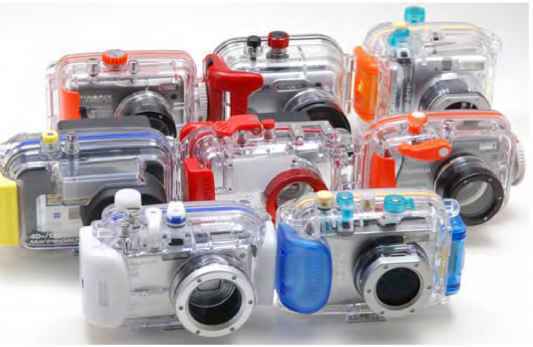 This allows the camera to capture images in lower light levels without the need for flash and can be extremely handy when following a group of divers through a wreck where the sandy bottom has been kicked up accidently. Using higher film speeds can result in a loss of clarity and detail to the image which is often referred to as "noise" or "digital grain." However, for wreck enthusiasts, this can actually be an advantage as it can give a fantastic artistic antique effect to underwater wrecks and artefacts. Filters are fabulous tools to help beginners taking underwater photographs for the first time to get wonderful colours as well as enhancing the colours of video footage taken on a compact camera underwater. I was at Los Islotes, Sea of Cortez last January at 7 ms and the viz was poor. I took these three photos, the first was with ambient light and there was too much light at the surface which ruined the photo, the second was with flash but this lit up all the particles in the water and the third was taken with a Magic Filter which gave the scene a colourful natural look. water. There are some filters made by UR Pro which simply screw onto the front of housings made by Olympus and Ikelite Housings. Magic Filters are a great alternative and can be cut to fit any kind of compact camera housing as well as SLR ones. Wide angle subjects such as wrecks or reefs can really benefit from the use of a filter as colours will be retained both in front or and behind the subject and the colours are really enhanced with a natural look. Simply remember to use them when there is lots of ambient light available, shooting with the sun behind you up to a maximum depth of between 10-15 metres depending on your conditions. When using Magic Filters, calibrating the camera's white balance can help give your subject richer colours for a little deeper. Using a film speed of at least 200 will ensure that subjects remain sharp, in lower visibility this may well need to be 400. White Balance may be a new term to those changing from film to digital, but those who are used to video recording have been using this method for a long time by using a white card to balance their cameras to the colour of light. With a digital camera's white balance controls, (normally marked AWB or WB on all camera models), neutral colours can be truly neutral under all lighting conditions and other colours are more natural or you can precisely control what colours look like for special effects. This function affects the colour reproduction of a subject dependent on its' surrounding light conditions. For example, using the daylight setting on your camera will help counteract bright sunshine on a subject in shallow water conditions up to 5 metres. By choosing the cloudy mode, this helps to warm up underwater subjects and can work as an optimum choice when there are bright pink subjects underwater such as Spanish Dancer Eggcases to give them a more natural pink colour instead of using manual white balance. Some cameras will allow you to set the custom white balance setting from the touch of one button such as the newer Canon range, whereas with other makes you may have to access this through the Function Set or Menu buttons. Whichever way, it is definitely worth the effort to find it and practice how to use it to get the most of your creative streak in underwater photography. Lionfish being brown can look very flat withoutflash. Here is an example to show the difference between a photo taken using Manual White Balance compared to one taken using just the BuiU-In Flash with a Canon Ixus 90. The eye of the fish is now lit as well as the patterns of the fish. using a white card, slate or the palm of your hand and hold it close to your camera so that the light is shining on it. Switch your camera to the Custom White Balance Pre-Set Mode, moving the card as close as possible to the camera so that the frame is filled with the white card and press the Menu/ OK button to calibrate this setting. Remember to switch your Exposure Value Button (+/-) to 0. By doing this, all underwater subjects with an element of white in them will be replicated as such, and thus the natural stronger blue colour-cast is almost eliminated. Some wide angle subjects such as wrecks where there is a strong blue background could be rendered to a bluey/violet hue to compensate for the blue natural effect. Some subjects don't work very well when manual white balance is set, such as brown subjects like lionfish or moray eels as their colours seem very flat compared to the same photo being taken with flash. Also the eye of the fish is not always clearly visible when using this setting and again can appear quite flat. Red subjects such as red anemones or firecorals are not as vibrant as those which are taken with flash. Careful thought must be used to avoid disappointing results with these kinds of subjects. When using custom white balance it is important to recalibrate your camera every time you change depth up or down by 5 metres to avoid photos becoming either over pink or red. It is just as important to remember that as subjects pass above such as moving dolphins, that if your camera is pointing upwards towards the surface whilst on the Custom White Balance setting, there is a high risk that the top part of your photograph will have a pink/red cast over it. Finally, always remember that manual white balance, filters and the flash on your camera all help in putting colours back into underwater photographs and, therefore, using two of these together, or even all three will render most subjects with a very undesirable pink or red colour cast.